'Travel Now' is the newest campaign of Travel Magazine. 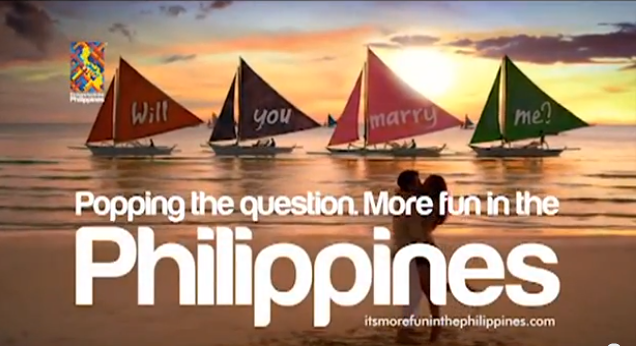 It was launched last January 24, 2013 at the Fashion Walk of Greenbelt 5. The launch event was hosted by WheninManila Editor-in-Chief Vince Golangco. Friends from the media and Mega, bloggers, Pinoy celebrity adventurers and among others were joined on this intimate gathering. 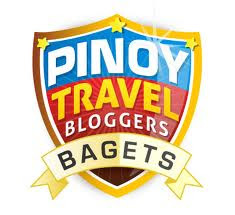 The campaign video was launched, featuring Pinoy TRAVEL ambassadors sharing their favorite travel experiences/destinations, why they love to travel, and why everyone should TRAVEL NOW. Check out the 2nd Billabong All Girls Surf Camp, happening on March 15- 17, 2013 at San Juan, La Union. For more details on 2nd Billabong All Girls Camp, visit www.alohaboardsports.com or call +63917.928.4583 for more information. Everyone in the Metro and from other provinces wants to witness the beauty of SAGADA. 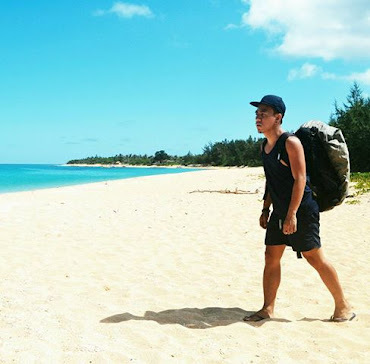 It is a travel destination for tourists who want adventure activities like hiking, caving, spelunking, camping, backpacking and others. Sagada is located 275 km. North of Manila, and 140 Km from Baguio. It is adjacent to Bontoc, the provincial capital. This magnificent place is famous for its “hanging coffins”- a traditional way of burying people. As what is usually expected every Panagbenga, I’m pretty sure millions of tourists will go to the Summer Capital of the Philippines to witness the extravagant Baguio Panagbenga Flower Festival. Everyone will definitely enjoy the month-long celebration especially Fluvial Float Parade, Grand Street Dancing Parade and the Grand Float Parade. 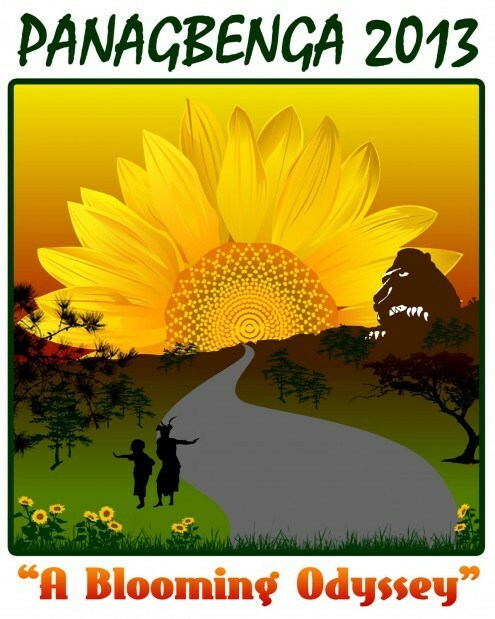 The 2013 Panagbenga theme is “A Blooming Odyssey”. The celebration kicks off on February 1, 2013. The Department of Tourism unveiled a new TV AD campaign aiming tourists who are looking for a beautiful place to spend the Valentine's Day with their loved ones. Zest Airways offers P388 seat sale promo with over 20,000 seats in all domestic destinations which runs from January 3 to 8, 2013. 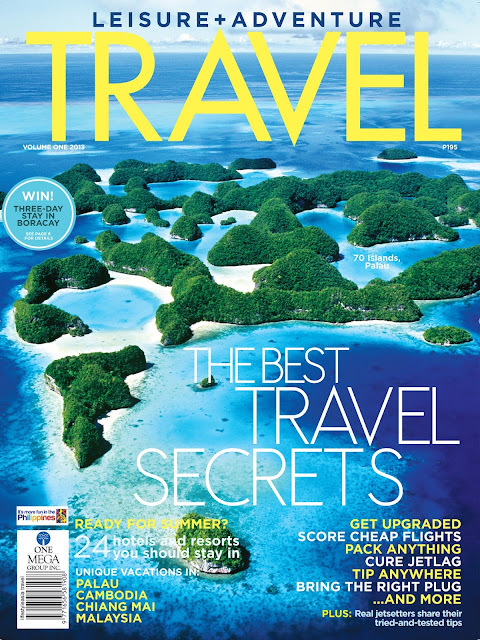 Travel period is from April 1 to May 31, 2013. All Zest Air seat sale promos are subject to rules and conditions. 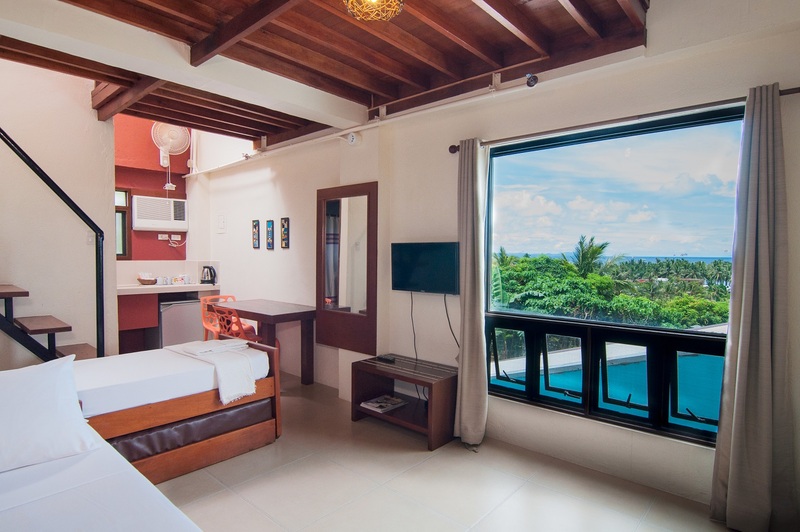 For booking, reservation and flight schedule, you may visit www.flyzest.com or at any Zest Air ticketing office. You can also call Manila: (02) 855-3333 for other inquiries. Cebu Pacific brings joy to everyone with its Jan to The World seat sale promo for selected domestic flights that runs today until January 7, 2013. Travel Period is from February 1 to March 31, 2013. 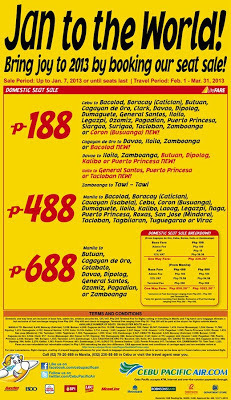 Domestic destinations covered by P188 seat sale promo include Cebu to Bacolod, Boracay (Caticlan), Butuan, Cagayan De Oro, Clark, Davao, Dipolog, Dumagueta, General Santos, Iloilo, Legazpi, Ozamiz, Pagadian, Puerto Princesa, Siargao, Surigao, Tacloban City, Zamboanga, or Coron (Busuanga) NEW! Airphil Express is now offering seat sale promo for as low as P213 on selected domestic and international destinations from December 31, 2012 to January 3, 2013. Travel Period is from July 1 to October 31, 2013. 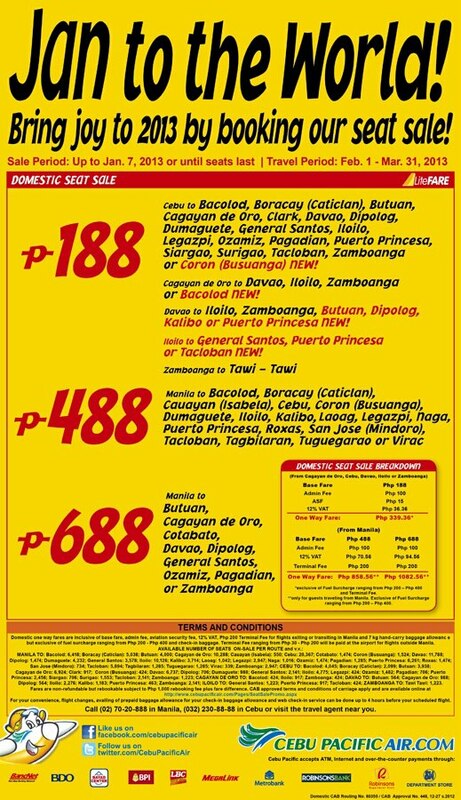 Cebu Pacific welcomes the 2013 with its low, low fares for January Juan seat sale promo to all Philippine destinations. Promo period is up to January 1 or until seats last. Travel Period is from June 1 to December 15, 2013.